I have been struggling with ways in which to teach Margaret Atwood in the high school classroom without resulting in a slew of teenagers running wild-eyed out of the classroom, razors in hand, ready to end their lives on account of reading such depressing literature (or what my mom like to call “slit-your-wrist-books”). Personally, I am an absolutely massive Atwood fan. It took awhile to come around, but once I did, I became a fan for life. Unlike many teens, I never read The Handmaid’s Tale in high school. I was in the International Baccalaureate program and they prefered to saddle us with pretentious literature generally reserved for first and second year university (think things like L’etranger, A Doll’s House, and Heart of Darkness). Instead, I got my first taste of Ms. Atwood in a Canadian Literature class in second year university, in which we read Surfacing on account of it being (this is verbatim what my prof. told us) “the shortest of Atwood’s novels, because I didn’t want to torture you all too badly”. I went in with negativity in my heart. Unsurprisingly, I was not a fan of Surfacing on first read and for the rest of the term, I avoided all paper topics in which we may have to reference it. However, on a three-month trek around Europe, I found myself falling into the ever-clichéd role of post-graduate Canadian tourist, and swapping novels at every hostel we stayed at. 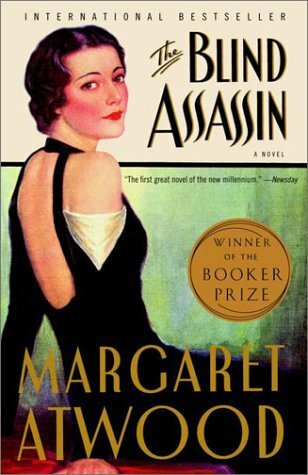 When I was low on English options at one such hostel, I came across Atwood’s The Blind Assassin. Not wanting to go through the shame I felt in university of attempting and horribly failing to learn Spanish, I decided that I would just have to try my hand at Atwood’s work again, it being my only English option. Much to both my surprise and joy, I found that I enjoyed The Blind Assassin. No, let me rephrase that, as “enjoyed” is far too much of an understatement. I absolutely LOVED it. The novel was beautifully written, full of deep and meaningful characters, and the story itself was unbelievable. In fact, when I finished, I picked it right back up again and read it once over. After my breakthrough with Assassin, I decided to try my hand with Atwood once more. I finally read The Handmaid’s Tale. I re-read Surfacing (and enjoyed it much more the second time around). I read everything of her’s that I could get my hands onto. When The Year of The Flood was released, I went to my local Chapters and lined up behind throngs of people while on a short break from work (which I dragged out substantially), where I could barely catch a glimpse of Atwood, just to hear her speak. And yet, despite all of this, I simply cannot find a way to incorporate Atwood into the classroom. Even with novels that are typical in the high school classroom, like A Handmaid’s Tale. I find myself unable to utilize them in my own practice. Perhaps it stems from the fact that I recognize myself as someone who liked English Literature of all sorts from a very young age. I was one of the few students who (not just liked) loved reading Shakespeare in high school. Thus, if I was not a fan of Atwood until y early twenties, how can I expect my students to, not simply enjoy her works, but also appreciate them? The short answer of it is this: I can’t. I pride myself on making my classroom not only fun, but also useful, meaningful, and practical. If students have no interest in Atwood, it doesn’t matter how important her themes are, they won’t be meaningful to them. Thus, the only conclusion I can come to is to address the common themes that Atwood plays with (feminism, power) through texts which students feel more of a connection to.